The first thing to point out is that the directions in this tutorial about adding email addresses to your GoDaddy account may vary slightly depending on what type of GoDaddy account you have and how it’s already setup. However, most of these differences are minor. If you do encounter a problem not covered in this guide, you can always make a free call to GoDaddy customer service and they will walk you through the process, 480-505-8877. To get started, use your internet browser to navigate to http://www.godaddy.com. Next, log in to the website with either your account number or user name with password. In the top navigation of the site, click on “Email” and then in the drop down choose “My Email Account”. A new sub-window will appear within the page with your email account plan options. If you don’t already have an active email account, use a credit to create a new account. Don’t worry if this process seems a bit confusing; GoDaddy’s email account setup isn’t very intuitive. One thing to keep in mind is there are two common types of email accounts GoDaddy provides you with on a standard hosting account: personal email for a single email address and a 100 email address pack. Click on the “use credit” link. Next choose the domain for which you want to add your new email address and click the continue button. After you’ve completed this step, it may not appear that anything has happened as it may still say “No Email Accounts”. If this occurs, just wait a minute or two and refresh your browser. 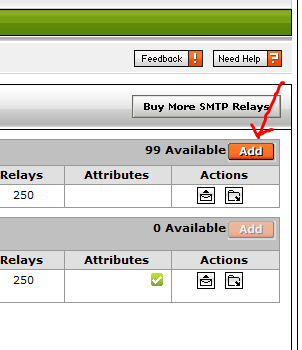 If you unintentionally choose the single email setup, you can always go back and use another credit to add a 100 pack. At this point you’ll want to click on “Manage Account” which will take you to your email account control panel. 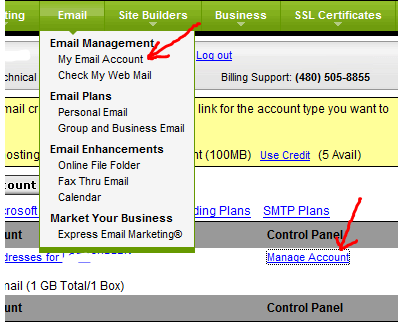 Once in the email control panel, click on the “add” button to create a new email address. Repeat this step for each email address you want to add. During this process on the individual email account setup screen, you’ll notice a check box that says “Make Catchall Account”. By checking this box, you’ll make that email address the default account that receives all email sent to “any-email-address@your-domain.com”. In other words, any email directed to an email address on your domain that doesn’t have an existing address set up, will get sent to the “Catch All Account”. A Catchall account can be useful because a potential client may mistakingly enter in an invalid email address @your-domain.com thinking you received it when otherwise you wouldn’t have. The downside is, you’ll receive more junk mail because the Catchall email account will receive all email sent to any email address directed toward your domain that isn’t valid. If you’re not receiving a lot of junk mail, it’s a good idea to set the Catchall, but if you find your inbox becoming overwhelmed with spam, then it may be time to turn it off. Another setting to note is your mail box size. 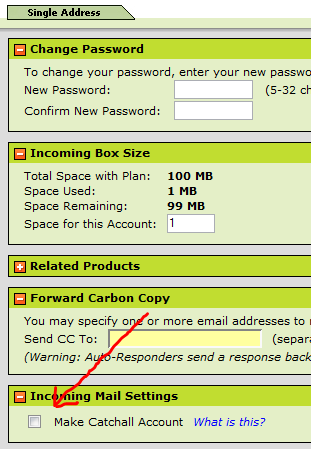 GoDaddy usually sets your mailbox size default value very low at 10mb. This means if you were to receive two 5mb files from a client or sender, your mailbox will become full and all future emails will bounce until you manually clear it out. If you’re setting up a large number of email accounts, you’ll need to leave yourself enough space to divide up amongst all your email accounts. If you only have a few to setup, you’ll want to increase the size. 50mb to 100mb per account is a good size to be safe. After you’ve finished adding your new email accounts, you’ll probably want to setup an email client on your computer to access and mange your account(s). Two popular email clients are Microsoft Outlook and Mozilla Thunderbird. If you’re a Windows user and have Outlook installed on your computer, click here for setup instructions. If you don’t want to use Outlook or you don’t have it installed, Mozilla Thunderbird is a great choice and it’s free. For setup instructions and to learn more about Thunderbird, click here.